The Quietus is offering one pair of tickets to this year's Bloodstock Festival for absolutely free, providing they go to a good home. Since 2005 Bloodstock has been bringing righteous heavy metal to the masses and, run by a keen group of enthusiasts, is one of the most diverse and enjoyable assualts on the ear-drums you're likely to hear this year. The headliners for the 2009 bill are Europe, Carcass, Arch Enemy, Blind Guardian and Cradle of Filth. 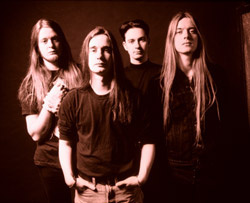 Which of the following isn't an extract from Carcass' hit 'Cadaveric Incubator Of Endoparasites'? A) "Organs savaged by rotten enzymes, rennin and rancorous cysts/ A festering abcess immersed in ravenous autolysis"
B)"Your lungs consumed in gore, slime and worm encrusted/ Brittle testes eroded in hot, corrosive succus"
C)"Cos since I've come on home, well my body's been a mess/ And I've missed your ginger hair and the way you like to dress"
D) "Slushy bowels move as our friends squirm/ Flatulent belches-dry, festered and warm"